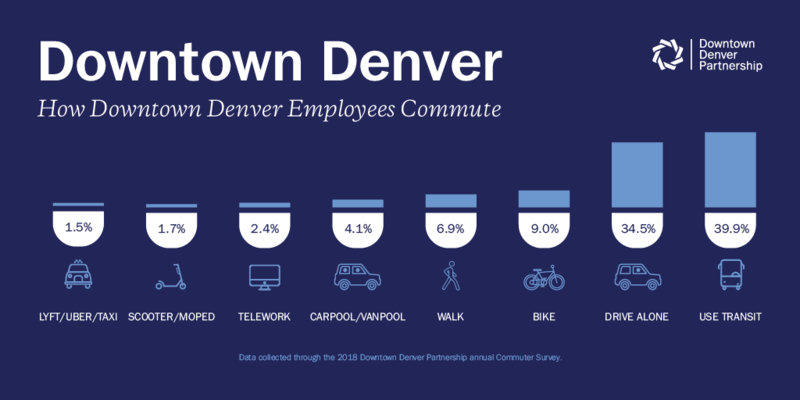 Each year the Downtown Partnership facilitates a travel behavior survey of Denver’s workforce, taking a deep look at how the downtown commuters are traveling to and through the center city. The results of this 12th annual commuter survey show that recent multimodal improvements downtown continue to support more people using all modes of transportation. Transit continues to be the dominant mode of choice for Denver commuters and, based on the survey, the best alternative to driving for most survey respondents. This year’s annual commuter survey confirms that the ideal downtown mobility system will provide convenient, attractive commuting options to support increased access to safe, affordable, and sustainable travel options. The Downtown Denver Partnership tracks mobility data and trends as part of its commitment to create a robust and visionary mobility network in Downtown Denver that enhances transportation options for all users, connects to surrounding center city neighborhoods, and strengthens economic development opportunities by ensuring seamless regional connection. Click here to read the full results of the 2018 Downtown Denver Commuter Survey.